Free Shipping Included! 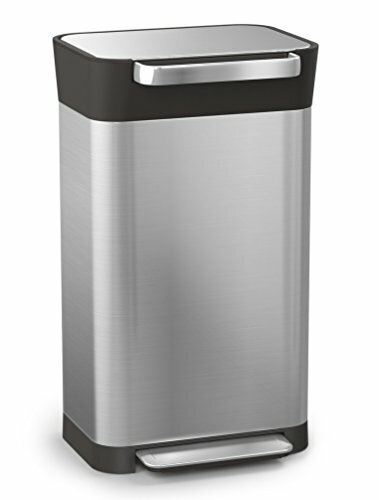 Joseph Joseph 30030 Intelligent Waste Titan Trash Can Compactor, 8 gallon / 30 liter, Stainless Steel by Joseph Joseph at Blog Free Here. MPN: 30030. Hurry! Limited time offer. Offer valid only while supplies last. Titan is no ordinary trash unit. It features a patented, hygienic compaction system that enables it to reduce trash volume by 66% after compaction. Titan is no ordinary trash unit. It features a patented, hygienic compaction system that enables it to reduce trash volume by 66% after compaction. Because Titan compacts your waste, it doesn’t need to be emptied as often, which in turn reduces the amount of liners you use and the how often you need to take out the trash. Titan features a replaceable carbon odor filter for any unpleasant smells and a fingerprint-proof stainless-steel coating. Titan is hygienic and mess-free. The unique design ensures only the inside of the plastic bag touches the trash while compacting, leaving you with clean hands and a clean bin. Titan is built to last. Its compaction system and foot pedal have been tested over 100,000 times and are engineered to withstand many years of service. We’re so confident in Titan’s enduring quality that we guarantee it for 10 years against manufacturing defects. Titan has an anti-tear design that won’t stretch or pinch the trash bag. We carry extra-strong, IW4 custom-fit liners for added peace of mind. It’s also compatible with standard plastic trash bags. A handy lid-stay feature ensures liner changes are quick and hassle-free, and it also includes a handle on the reverse to make moving easy. Built to last - Titan's compaction system and foot pedal have been tested over 100,000 times to ensure they withstand many years of service. Includes a 10-year guarantee.